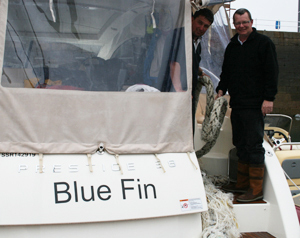 The alarm on board our control boat Blue Fin sounded at 4am FST – that’s 3am BST! The team stirred and half an hour later Time Flies was exiting Cherbourg breakwater under the cover of darkness – its mission was to assess the conditions of Cap de la Hague and the Alderney Race. Claire and Richard reported smooth conditions in the Race and a southerly wind as forecast. The rest of the fleet began departing at 6am FST and Time Flies awaited their arrival on track in the Race. The morning light revealed a grey, damp and miserable day. Rain featured for most of the passage so flybridges were abandoned for the comfort of wheelhouses. The fleet had at least 3 knots of favourable tide going through the notorious Alderney Race, which carried them down towards the west side of Jersey. Further into the passage the visibility dropped to just below a mile and a mist unfortunately shrouded the Jersey coastline. 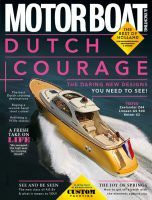 MBM Control boat Blue Fin experienced a couple of problems en route. Nearing the coast of Jersey the crew came to the aid of Bénéteau ST 34, Bluebell who had lost some of their electronics. Later Blue Fin itself was attacked by a ‘sea serpent’ while on passage, in the shape of a dishevelled ship’s mooring line. The chunky line stopped the axius-powered Jeanneau Prestige 38S dead in its tracks, but luckily the heavy mass of rope was easily untangled by Keith and Neale and they were soon underway again. By 9am BST the first of the fleet were filing into St Helier harbour, and by midday all boats were fuelled and berthed and participants had a new town to explore. By mid afternoon the rain had subsided and the fleet basked in some well deserved sunshine. 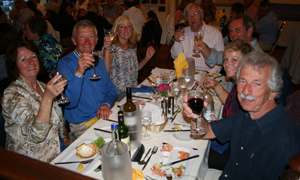 Later in the evening the MBM team had organised a group meal at the St Helier Yacht Club. Crews received a warm welcome at the club and enjoyed exquisite food as always. The MBM team would like to thank chef Matthew and his staff for a superb evening. Tomorrow the fleet will enjoy a rest day in St Helier. Some crews plan to hire cars to travel about the island, while others will hit the high street for some retail therapy.